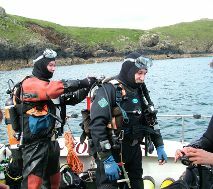 Pembrokeshire is one of the premier dive locations in British waters with a coastline recently named 2nd best in world in a National Geographic writer’s poll. The coastline measures approximately 200 miles in length, boasts one of only three marine reserves in the UK, and has many recognised dive sites suitable for beginners through to advanced. However, there are hazards to be managed and around Pembrokeshire, tidal constrains must be observed. 5 knot flows are not uncommon and it is therefore imperative that you obtain local knowledge or a local skipper. Dive charter rates start from £450/day for 2 dives. This includes all the tea, coffee or soup you dare put in your bladder!